The humble tax disc was abolished in 2014, but some three million cars still have the dinky circular piece of paper tacked to their windscreen, according to new research. More than one in ten of the 18,000-plus motorists (11 per cent) polled by the AA and Populus in mid-September still show a tax disc in their car. Considering there are more than 36 million vehicles registered to drive on UK roads, this works out at around three million cars. 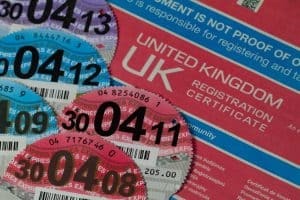 When asked why they still display a tax disc, half said it plays a practical role, reminding them when the tax is due. The other half reckon it affects the cosmetic look of the car and that cars “look weird without one”. Three in five motorists removed their tax disc back in 2014, while almost a quarter (23 per cent) have replaced their car since 2014 and their new vehicle didn’t have one. This research comes after it emerged that drivers paid out £41 million in fines due to unpaid Vehicle Excise Duty (VED) in 2016 – £10 million more than in the year before. For 93 years, motorists were required by law to display a valid tax disc to prove they’d paid the right amount of road tax (or ‘Vehicle Excise Duty’ as it’s officially known). However, all that changed when technology and digitalisation rendered the physical paper tax disc redundant and it was eventually scrapped. Jack Cousens, head of roads policy for the AA, said: “There is a sense of nostalgia with keeping a tax disc, but for many, it provides a tax and MOT test reminder too.